– Warwick Marsh, CEO of dads4kids, Recipient of the 1998 FOL Fatherhood of the Year Award. – Veronica Kearney, Mother of four and teacher for 35 years. 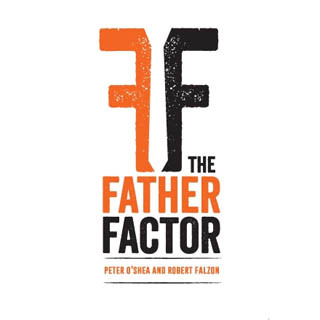 “In their encouraging and inspiring book, The Father Factor (pp. 186), Peter O’Shea and Robert Falzon have done Australian men (and therefore their families or future families) a great service. They write about father matters and it shows (if anyone is uncertain) that fathers really do matter in the lives of their children. Men who are searching for guidance and wisdom in terms of being a good father, and in my experience that is most men who are fathers or who want to be fathers, will benefit from giving this book their time and attention. The authors assert that the impact of engaged and responsible fathering is felt far beyond the boundaries of the family. Indeed, society is safer and healthier for all because of it”. – Dr Brian Sullivan, Counsellor and teacher. The Father Factor prompts the reader to consider the evidence on what drives success and happiness. What emerges from the research is the finding that the relationships with the father and the mother tend to powerfully affect long-term happiness, financial success and work success. The resolution of one’s relationships with father and mother, then, is pivotal to the pursuit of success and happiness. Because father-child relationships have tended to break down more dramatically in contemporary society than mother-child ones, this book gives particular emphasis to father-child ones. In seeking to help the reader to resolve the crucially important relationships with parents and navigate the journey to wholeness, the book provides various evidence-based strategies, illuminating case studies and links to useful resources. Peter O’Shea has been working with young people for over 30 years, first as a youth leader and then as a teacher. He has worked as an academic for the past 23 years, during which time he has been employed at the University of Queensland (UQ), the Queensland University of Technology (QUT) and Royal Melbourne Institute of Technology (RMIT). He was appointed as a Professor in the Faculty of Built Environment and Engineering at QUT in 2007 and is currently an Adjunct Professor at QUT. Robert Falzon is a husband, father, businessman, author and co-founder of menALIVE.